Payday lender Wonga has announced its intention to go into administration after losing its battle to stay afloat.The company said in a statement that it had assessed all options and had decided that administration was the appropriate route.It had already stopped accepting new loan applications as it fought to stave off collapse.Its demise in the UK follows a surge in compensation claims amid a government clampdown on payday lenders.Grant Thornton will be acting as administrators. In a statement Wonga said: "Customers can continue to use Wonga services to manage their existing loans but the UK business will not be accepting any new loan applications. Customers can find further information on the website. 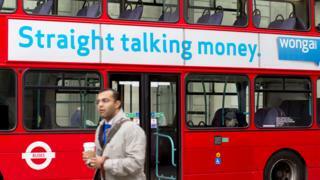 "Wonga's overseas businesses continue to trade and are not part of this announcement. "Wonga, which was the UK's biggest payday lender, had faced criticism for its high-cost, short-term loans, seen as targeting the vulnerable. In 2014, the Financial Conduct Authority found that Wonga's debt collection practices were unfair and ordered it to pay ?2.6m to compensate 45,000 customers. Wonga: Where have all the borrowers gone? What's gone wrong with Wonga? Since then, payday loan companies have faced tougher rules and have their charges capped.This hit Wonga's profits hard. In 2016, it posted pre-tax losses of nearly ?65m, despite claiming its business had been "transformed". It continued to face legacy complaints and was forced to seek a bailout from its backers in August amid a surge in claims. It was a huge fall from grace for Wonga, which in 2012 was touted to be exploring a US stock market flotation that would have valued it at more than $1bn (?770m). Analysis: Kevin Peachey, personal finance reporterWonga never considered itself to be a payday lender, preferring instead to describe itself as a maverick technology company that happened to sell loans. Its technology was groundbreaking, allowing the smartphone generation to choose how much they wanted to borrow with the slide of a thumb.That convenience, matched with a huge advertising campaign featuring amusing puppets and upbeat voiceovers, proved a hit. At the height of its success in 2013, Wonga had a million customers. But Mick McAteer, founder of the not-for-profit Financial Inclusion Centre, said this demand was a bubble: "They were flogging [credit] and they created demand for it. "In other words, some borrowers simply did not need to borrow from a payday lender, but were attracted towards these high-cost, short-term loans anyway. The collapse spells the end of a rags to riches story of a company that was vilified for its conduct when lending to people who could not afford to repay.The market has changed as a result of the FCA's crackdown, and thousands of former customers have sought compensation. Anyone awaiting compensation payments from Wonga is now likely to be in the queue for a payout from the sale of any assets.Many have said they will not mourn the loss of Wonga.Guy Anker, deputy editor of MoneySavingExpert.com, said: "Payday loans are hideously expensive and morally questionable products - and many have been mis-sold to vulnerable customers. They should only be seen as a loan of absolute last resort. "So to have one fewer payday loan lender - and Wonga was a biggie - is positive for consumers, but of course is very sad for the staff who will have lost their jobs."